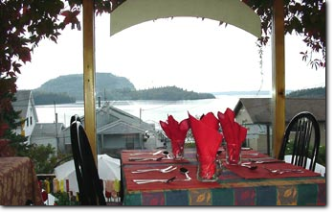 Since 1988 the Serendipity Gardens Café has provided fine dining in Rossport, Ontario, a small former fishing village on the north shore of Lake Superior, two hours east of Thunder Bay and six hours west of Sault Ste. Marie. Enjoy the panoramic view of Rossport Harbour while you dine on our international cuisine and relax to our eclectic selections of 'tunes'. We are fully licenced, have an outdoor patio in a whimsical garden setting, and are open all year. We also display the works of local artists in our café.